Sport performance analysis techniques help coaches, athletes and sport scientists develop an objective understanding of actual sport performance, as opposed to self-report, fitness tests or laboratory based experiments. For example, contemporary performance analysis enables elite sports people and coaches to obtain live feedback of match statistics and video sequences using flexible internet systems, systems that have become an indispensible tool for all those involved in high performance sport. 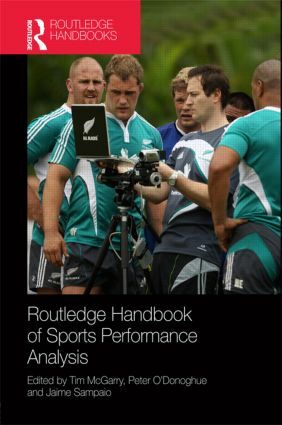 The Routledge Handbook of Sports Performance Analysis is the most comprehensive guide to this exciting and dynamic branch of sport science ever to be published. The book explores performance analysis across the four main contexts in which it is commonly used: support for coaches and athletes; the media; judging sport contests, and academic research. It offers an up-to-date account of methodological advances in PA research, assesses the evidence underpinning contemporary theories of sport performance, and reviews developments in applied PA across a wide range of sports, from soccer to track and field athletics. Covering every important aspect of PA, including tactics, strategy, mechanical aspects of technique, physical aspects of performance such as work-rate, coach behaviour and referee behaviour, this is an essential reference for any serious student, researcher or practitioner working in sport performance analysis, sport coaching or high performance sport. Tim McGarry is an associate professor of the Faculty of Kinesiology at the University of New Brunswick, Canada. He has published many journal articles and book chapters on various aspects of movement control and sports performance, and serves as an advisory editorial board member on the Journal of Sports Sciences and the International Journal of Performance Analysis in Sport. Peter O’Donoghue is a Reader at Cardiff Metropolitan University, UK. He is Chair of the International Society of Performance Analysis and General Editor of the International Journal of Performance Analysis of Sport. His research interests include racket sport performance and opposition effects in sports performance. Jaime Sampaio heads the Team Sports Laboratory at University of Trás-os-Montes and Alto Douro, Portugal. He heads several funded research projects, has published more than 50 ISI indexed papers, is on the editorial board of several international journals and is Editor-in-Chief for the Open Sports Sciences Journal.